Wick (shoulder) was placed on injured reserve Monday, Jim Wyatt of the Titans' official site reports. 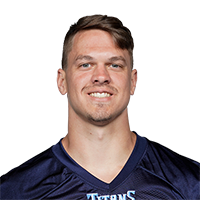 Analysis: Wick signed with the Titans on Dec. 11, but he did not play a single game with the team due to his lingering shoulder injury. The 25-year-old now joins fellow Tennessee tight ends Delanie Walker (ankle) and Jonnu Smith (knee) on season-ending injured reserve. Wick (shoulder) is ruled out for Saturday's game against the Redskins, Turron Davenport of ESPN.com reports. Analysis: Wick's only participation in practice this week came in the form of a limited session on Wednesday. The depth tight end has yet to play in a game since signing with the Titans on Dec. 11 and will work to make his Tennessee debut against the Colts in Week 17. Wick was ruled out for Sunday's game against the Giants with a shoulder injury, Jim Wyatt of the Titans' official site reports. Analysis: Wick signed with the Titans on Tuesday and promptly found himself on the injury report, and he was unable to practice Thursday and Friday. Given he never practiced fully after signing, the offense is unlikely to be impacted by Wick's absence. Wick signed a contract with the Titans on Tuesday, Jim Wyatt of the Titans' official site reports. Analysis: Wick's spot on the 53-man roster comes following the placement of Jonnu Smith (knee) on injured reserve. The 25-year-old will provide depth behind fellow tight ends Luke Stocker, Anthony Firkser and MyCole Pruitt as the season progresses. There are no videos available for Cole Wick. Click here to view all videos.